A.W. Sjöstrand, Stockholm; sale, Lepke, Berlin, 21 March 1933, lot 45.
with J. van Duijvendijk, The Hague. Anon. Sale, Paul Brandt, Amsterdam, 29 November 1960, lot 17. Central Picture Galleries, New York, 1966 ($3,000). On the basis of a colour transparency, Alice Davies, to whom we are very grateful, accepts this painting as an autograph work by Allart van Everdingen, datable to the late 1660s. Following his journey to Norway and Sweden in 1644, Van Everdingen frequently returned to the theme of a waterfall in a Scandinavian landscape from 1647 until the 1670s (see also the note to lot 138). The earliest vertical composition of the theme is the painting dated 1648 in the Niedersächsisches Landesgalerie, Hanover. Only a few of the pictures are dated, leaving only stylistic grounds as the basis for reconstructing a chronology for the majority. 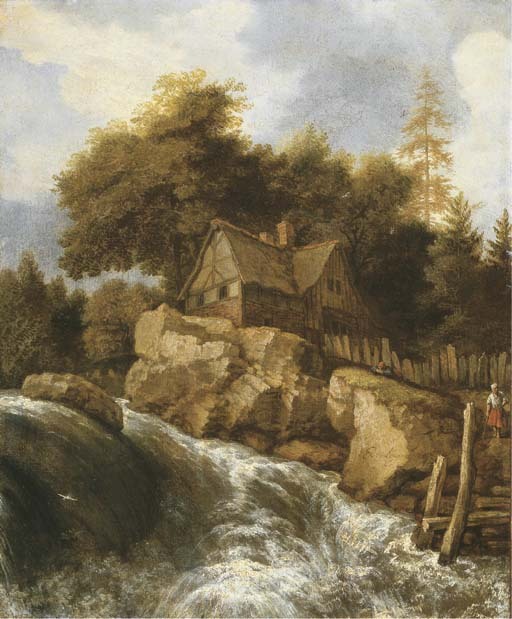 The present lot, with the pink highlights enlivening the rock formations, green and blue tones throughout the water and subtly highlighted boulders and logs, can probably be dated to the late 1650s, when the artist was active in Amsterdam; it can be compared with a picture in a private collection, New York, datable to after 1655 (A. Davies, Allart van Everdingen, 2001, no. 81). Sold with a certificate by Dr. Walther Bernt, dated 5 November 1966.